Blue Diamond is also UL (Underwriters Laboratory) listed for power applications. BDI UL duct meets UL 651A Continuous Length HDPE Conduit and BDI is used under UL 1990, Nonmetallic Underground Conduit with Conductors. UL 1990 is the specification for UL power cable in UL conduit-CIC. UL listed HDPE is compliant with Article 353 of the 2011 NEC NFPA 70 National Electric Code. UL Listed HDPE conduit is available in EPEC-40 (Schedule 40) and EPEC-80 (Schedule 80) wall thicknesses from ½” through 6”. It is also available from Blue Diamond in EPEC-B (SDR 13.5 wall thickness) in 1 ½” through 6”. 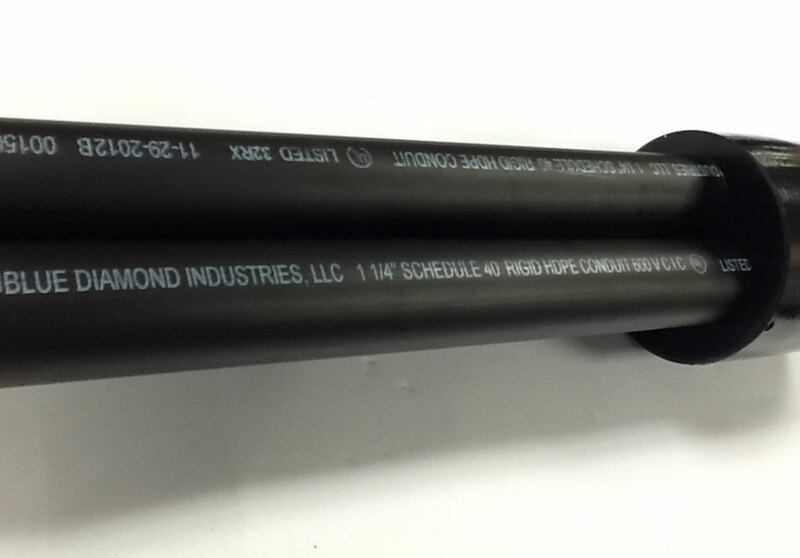 UL listed conduit from Blue Diamond has a high tensile strength to weight ratio, superior crush resistance and a low coefficient of friction which makes it ideal for HDD (Horizontal Directional Drilling) and plowing. UL Listed Conduit is not available in ribbed inner wall. UL conduit only provides for smooth wall pipe. Note to Engineers: NEMA TC7 conduit is not automatically UL certified. UL certified conduit must be produced and tested to UL standards UL 651A or UL 1990. NEMA TC7 does meet ASTM F2160 and vice versa.